The world's first pure nerve stem cells made from human embryonic stem cells has been created by scientists at the Universities of Edinburgh and Milan. It is hoped the newly-created cells will eventually help scientists find new treatments for diseases such as Parkinson's and Alzheimer's. BBC science correspondent Pallab Ghosh said the cells should help researchers test the effectiveness of new drugs. Stem cells are "master" cells that can become many kinds of tissue. Nerve stem cells are those which help build the brain and central nervous system. The university's Dr Steven Pollard said: "This is incredibly exciting in terms of curing disease. "We may be able to create the disease in a dish. If we do that, we'll be able to better understand the disease and also to test drugs." Our correspondent said the long-term aim of the Edinburgh research is for cells to be used to build replacement neural tissue for Alzheimer's and Parkinson's sufferers. But he said the more immediate use for the artificially-created cells is to test out the effectiveness of new drugs. Professor Austin Smith, who led the research at the University of Edinburgh, told the BBC: "We're already talking with the bio-technology and bio-pharmaceutical companies about taking these cells into screening systems for new drugs. Hopefully that will come to pass within two to three years. "In terms of the possibility of using the cells for transplantation, that's a much more difficult and longer term thing and I think there we're talking more of the five to ten year range." However, critics say it is unethical to use human embryos in scientific research. Previous attempts at creating the nerve cells have produced contaminated samples that have not been scientifically useful. Robert Meadowcroft, of the Parkinson's Disease Society, welcomed the news: "The purity of these cells should prove particularly valuable in studying the possibilities for transplantation and replacement of damaged tissue." The Alzheimer's Society echoed this view, saying that the inability to grow nerve cells from human embryonic stem cells had previously been a major obstacle to progress in this area. The breakthrough comes three months after scientists at Newcastle University announced they had successfully produced a cloned embryo using donated eggs and genetic material from stem cells. 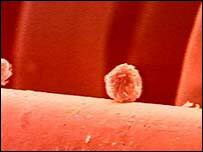 It was the first time a human cloned embryo had been created in Britain.